Independent Taipei mayor Ko Wen-je was re-elected in local elections last Saturday. 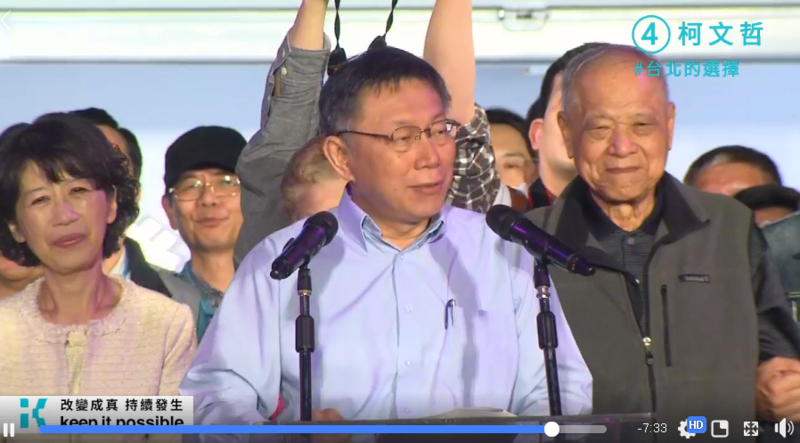 Ko defeated his main rival -- KMT candidate Ting Shou-chung -- by slightly over 3,000 votes. It was a long and bitterly-fought battle for Ko and his supportors, even on election day. Since both candidates received 41% of the vote, it took more than ten hours to tally the ballots; the final results were only announced after midnight. Four years ago, the surgeon-turned-politician received 57% of the vote, thanks to the help from the then opposition Democratic Progressive Party (DPP). To throw its full support behind Ko, the DPP didn’t even field its own candidate in that year’s election.